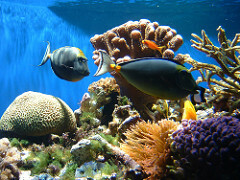 How Worrisome Is Ocean Acidification? Global warming tends to receive the bulk of attention these days, but it's worth remembering that hotter temperatures aren't the only consequence of putting more carbon-dioxide into the air. As the oceans keep absorbing more CO2, the chemistry of seawater is changing at a fairly rapid clip—steadily becoming more acidic. But experiments alone can't show how acidification will affect the broader ocean. So another option is to study the past. And that's what two researchers at the University of Bristol, Andy Ridgwell and Daniel Schmidt, have done in a new study published in Nature Geoscience. About 55 million years ago, for instance, there was a huge spike in carbon-dioxide released into the air over the course of about 10,000 years. This was known as the Paleocene-Eocene Thermal Maxium (PETM). No one's quite sure what the cause of the CO2 spike was: At the time, the Earth had been warming for a variety of natural reasons, and that may have kicked off feedback effects like the release of methane trapped in ice. But the upswell in CO2 had a devastating effect—temperatures rose between 5°C and 9°C, and a large number of deep-water species went extinct. The [Paleocene-Eocene thermal maximum, or PETM] was powerful enough to trigger widespread extinctions in the deep oceans. Today’s faster, bigger changes to the ocean may well bring a new wave of extinctions. Paleontologists haven’t found signs of major extinctions of corals or other carbonate-based species in surface waters around PETM. But since today’s ocean acidification is so much stronger, it may affect life in shallow water as well. “We can’t say things for sure about impacts on ecosystems, but there is a lot of cause for concern,” says Ridgwell. It's not totally certain that a mass die-off in the ocean, comparable to the one 55 million years ago, is inevitable if carbon-dioxide emissions keep rising. But there are a lot of ominous signals. And what we can say is that we're conducting an unprecedented experiment on the oceans—one we can't, alas, reverse if it goes badly. This also has some implications for some of the geoengineering schemes that have been proposed to tackle climate change. Many of the leading ideas for artificially cooling the Earth's climate, in case the world can't rein in its emissions, focus on adjusting temperature. So maybe we would shoot sulfates in the air to reflect more sunlight or put giant mirrors in space. But any scheme that doesn't tackle the growing amount of carbon-dioxide in the air would do nothing for ocean acidification—and that has the potential to be a very big deal on its own.